The shrubs and small tree selection was made by studying pre 1900 plant catalogues at Alexander Turnbull Library and by reading books about colonial plantings in New Zealand. The plants were selected for site specific areas at the Halfway House. For example, we wanted to develop a woodland garden with white scented flowers near the house, and we need plants that can withstand damp soil in a low lying wet area near the rose arbour. We searched for wind hardy plants with a permeable structure to grow along the horse paddock fence line. Several plants have been gifted as cuttings from gardeners who are able to provide their provenance. The shrubs and small trees are photographed in the Halfway House garden. Gifted cutting: Golder Cottage, Upper Hutt. Planted: 2016. Horse paddock fence line. A full headed pink flower. Brilliant red autumn flower. Gifter: Golder Cottage, Upper Hutt. Maida Baddiley lived to the grand age of 106 years. Her hydrangea was originally grown in her garden at 14 Newtown Avenue, Newtown, Wellington. She took it from there to her garden in Paparangi in 1973. It has a rich dark blue flower fading to plum. Gifter Maida Alexandra Baddiley (1911-2017). 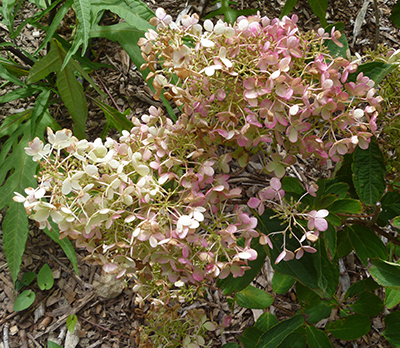 Hydrangea Paniculata Grandiflora. (x 3). 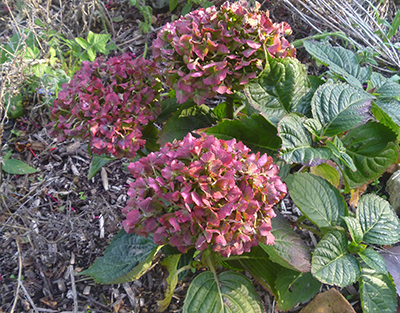 A distinctive form of Hydrangea with dark green, oval, pointed foliage that turns bronze in autumn. The main event is in spring when there is a spectacular display from the long panicles of frothy cream blossom. The flowers gradually fade to pink as they age. Delicious and deciduous. Colour cream and pink. Upright habit. Catalogue: 1899 Horton’s Premier Nurseries, Pahiatua; 1899-1900 D Hay & Son, Auckland. Gifter: Celia Wade-Brown Mayoral Fund. 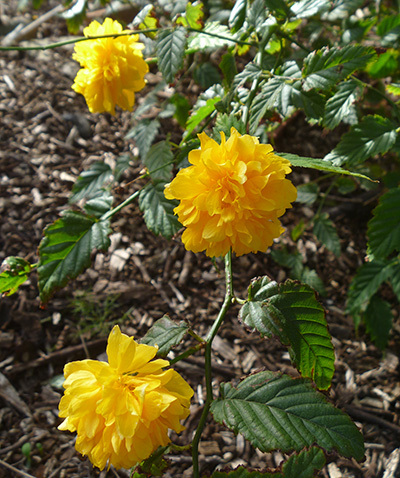 Double Flowered Japanese Kerria. The Yellow Rose of Texas. Has pom poms of yellow on bare branches in spring and with climate change, we have had a second flowering in mid summer. Came to Kew Gardens in England in 1836. Magnolia Conspicua aka Denudata. (x 3). 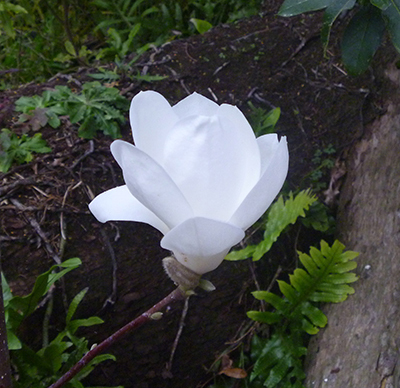 One of the earliest magnolias to flower. 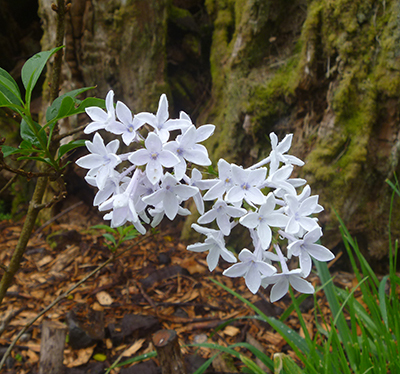 White fragrant flowers. Dark green leaves. Specimen tree for lawns and borders, parks and gardens. Growing conditions, full sun to part shade. Tree is frost hardy. Will tolerate all soils from sand to clay as long as it is well drained. Catalogue: 1861 William Hale, Nelson. 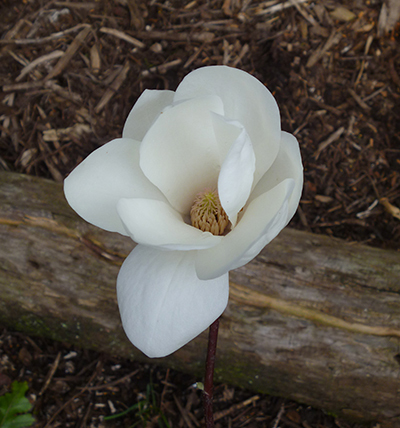 Magnolia gracilis Salisb. is a synonym of Magnolia liliiflora Desr. 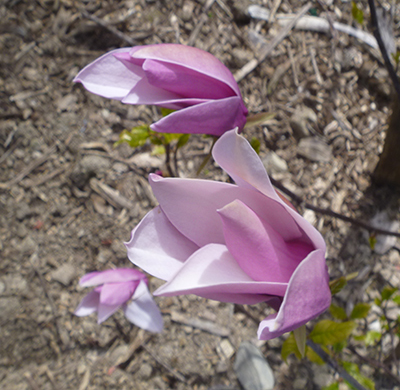 Native to China and introduced to Europe in 1790 this Magnolia has a multi-branched, shrub-like habit. 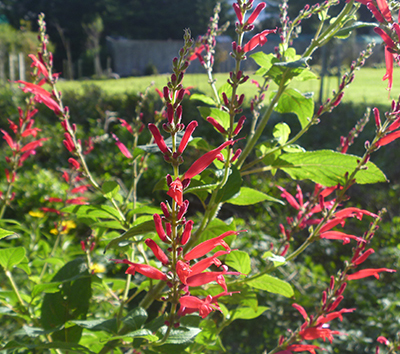 The blooms open from long erect buds and appear for several months over spring. Rich purple on the outside with white interiors. Likes a sunny, sheltered spot with acid soil. Deciduous. Planted: 2017. 3 x rose arbour. Good low growing hedge. Naturally bushy and rounded, it is further enhanced with a light trim. 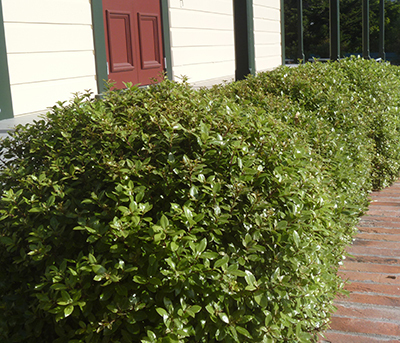 This is an alternative to buxus sempervirens (box) which was commonly used in early New Zealand and since 1998 has been affected by blight in this country. Planted: 2017. Formal lawn edge, flower bank edge. Rhododendron Princess Alice. (x 3). Named after Queen Victoria’s second daughter, Alice Maud Mary, 1843-1878. 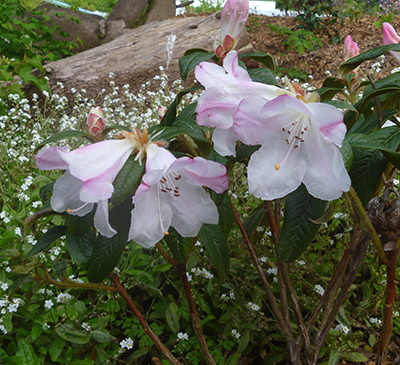 A fragrant Rhododendron with elegant white blooms that open from pale pink buds. Prefers a semi-shaded, sheltered spot in the garden. Needs protection from harsh frost. Evergreen. Described in the 1899-1900 catalogue of D Hay & Son (est, 1855), Montpellier Nursery, near Parnell, Auckland as Princess Alice: Dwarf habit. Flowers bell-shaped, white tinged with pink; very fragrant. Donator: Celia Wade-Brown Mayoral Fund. White Persian lilac. Delightful, fragrant and harmonious. Panicles of white scented blooms. Catalogue: 1878 W.W. McCardle, Masterton. Viburnam Opulus. Geulder rose. (x 10). Broadly columnar, deciduous. White flowers in spring - scarlet edible fruits in autumn. Leaves red in autumn. Prefers moist and wet sites. Catalogue: 1845 James Dickinson, Hobart. Supplier: Appleton Trees, Wakefield, Nelson. Planted: 2017. Woodland garden (3), rose arbour (6), stream bank (1). Viburnum Opulus Sterile. (x 3). 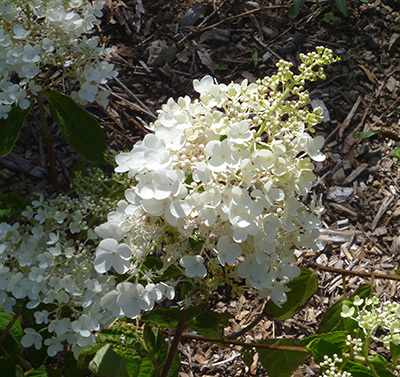 The main feature of this deciduous shrub is the large globular, white, 'snowball' flower-heads that appear in spring. 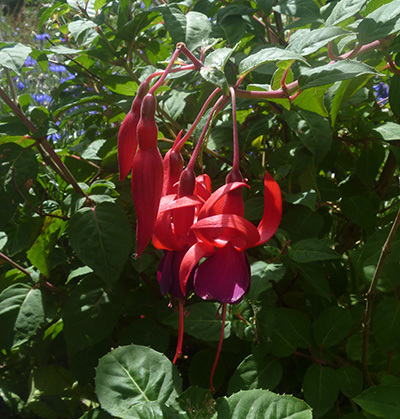 Forms an open, graceful shrub with green leaves that have good autumn colour. Easy to grow and a firm favourite for good reason. Grows in most soil types. Needs well drained soil. Tolerates wet soils. Frost hardy. Grows in sun or semi-shade. This shrub doesn't meet our pre 1900 criteria however it is perfect for our climate and soil and is rare to find in gardens these days. It is a real joy to children who love the ball like flowers. We couldn't resist! Planted: 2017. Woodland garden, flower bank, stream bank.